Folks, please do NOT let your contractor or painter “prep the walls for wallpaper.” They simply don’t know how to remove wallpaper properly, and they don’t know what is required to prepare the surface for the new paper. Do a Search here (upper right corner) for more examples. In this case, “I know that he removed the old paper, because I saw piles of it on the floor,” said the homeowner. But this photo proves that he didn’t. Nor did he bother to remove the towel bar, because when it was removed later, you can see the old wallpaper still under it. 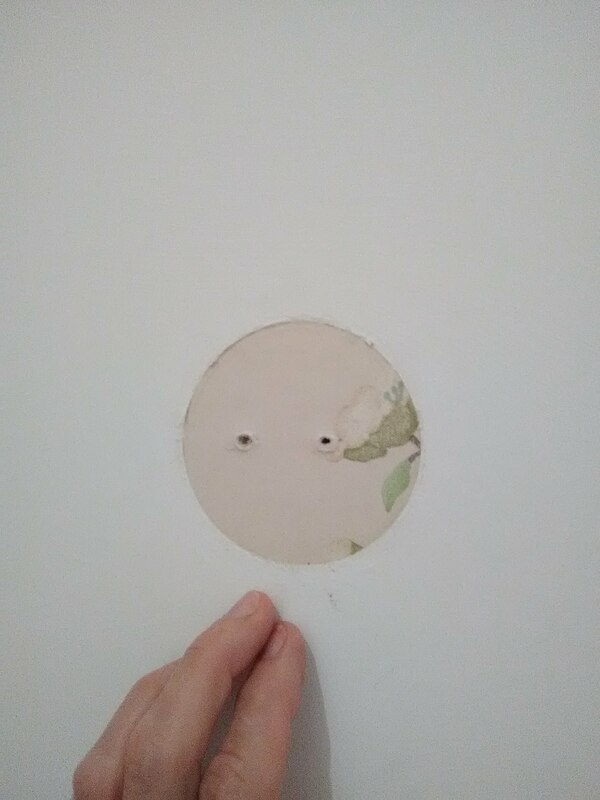 I put the original wallpaper up back in the ’90’s, so I know that, with my good primer underneath, with a bucket of warm water and a little time, that paper would have come off easily and left the wall in perfect condition for new paper. Instead of properly removing the old paper, this contractor skim-floated over it. That’s the thick white stuff you see in the photo. After sanding the wall smooth (which he did OK in most of the room, but, as usual, did a less than stellar job in corners and around moldings and door trim), he should have removed dust from the walls with a damp sponge – but virtually no contractor bothers with this step. Removing dust is crucial, because if dust is left on the wall, it may hold up OK under paint, but when wallpaper is applied on top of it, when the paste dries, the paper shrinks a tad and puts torque / tension on the wall. When the walls are dusty, there is the potential for the surfaces to delaminate (come apart), leaving you with seams that gap and curl back. These cannot be glued back down, because the surface underneath is unstable and provides nothing for the paste to adhere to. So next the contractor primed the walls. There was no mention of what primer he used. But I can tell you that primers formulated for paint are not advisable under wallpaper. PVA-based primers are commonly used under paint; they are designed to keep the paint from flashing. But they are soft and don’t provide a stable surface for wallpaper. Primers formulated for wallpaper are designed to 1.) adhere to the underlying surface, 2.) provide a “crystalized” surface that the wallpaper paste can bite into and grab ahold of, 3.) provide a surface with “slip,” which will ease installation of the new wallpaper, 4.) allow for easier removal of the wallpaper later, with minimal damage to the wall, and 5.) withstand the torque / tension created by the drying wallpaper. Ask a contractor or painter if he knows any of the information in the paragraph above. You will receive a blank stare. All more reasons to NOT let the contractor prep the walls for paint.